Figure 1 Comparison of Cartesian and Manifold Fast Fourier transform-based sampling approaches. The interaction energy between two almost rigid macromolecules can be described as the sum of correlations of characteristic functions defined on the component molecules, which lead to the development of fast Fourier transform (FFT) based docking methods. Considering the receptor protein fixed, traditional FFT methods make an exhaustive scan of the rotations of the ligand, and for each rotation apply the convolution theorem and fast Fourier transforms to rapidly compute correlation functions for all translations. Although the approach deals with just half of the degrees of freedom, the use of FFT still provides substantial numerical advantage. However, this advantage starts to erode, when we want to introduce more complex energy function and, when adding experimental constraints, since each such constraint adds a new correlation function. Instead of using classical decomposition of the encounter complex space to we propose to use natural manifold structure of interaction encounter complexes is manifold. Such decomposition will require only expression of one dimensional translation in rotational coordinates, which is much simpler. 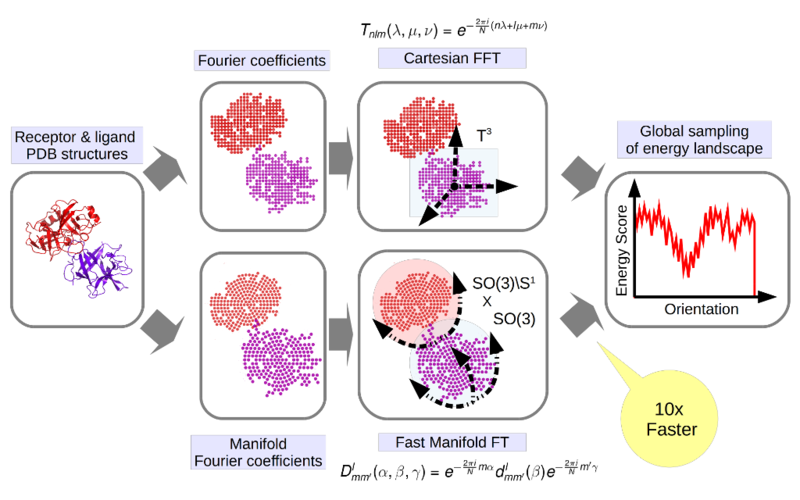 We are developing generalization of FFT based approach to such space (manifold FFT) , which searches through 5D manifold space and samples only one translational parameter conventionally, thereby substantially accelerating the search. The greatest advantage of the proposed algorithm is that we calculate the Fourier transforms for the P components of the scoring function only once, perform manifold search in 5 dimension, and for each one-dimensional translation calculate a single inverse Manifold Fourier Transform. Hence using the method can be efficiently used with scoring functions of high complexity, which wasn’t previously possible . Padhorny, D., Kazennov, A., Zerbe, B. S., Porter, K. A., Xia, B., Mottarella, S. E., Kholodov, Y., Ritchie, D. W., Vajda, S. & Kozakov, D. (2016) Protein–protein docking by fast generalized fourier transforms on 5d rotational manifolds. IN Proceedings of the national academy of sciences, 113.E4286-E4293.